A terrorist attack by a Changeling brings Captain Sisko back to Earth to prepare Starfleet security for an apparent Dominion invasion. Am I the only one creeped out by the fact that the terrorist attack on Earth occurs at time index five-nine-eleven? If this hadn't been made well before 2001, I would not accept that as a coincidence. 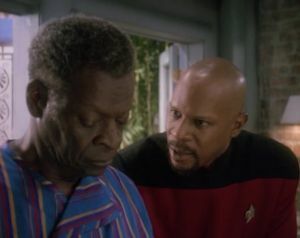 After talking about him on and off for three plus seasons, we finally get to meet Captain Sisko's father, Joseph Sisko, played by the great Brock Peters. Peters also played Admiral Cartwright in Star Trek IV: The Voyage Home and Star Trek VI: The Undiscovered Country. I wonder what it's like to live in a world where you can be in San Francisco in the afternoon and New Orleans in time for dinner. "Our Gods are dead. Ancient Klingon warriors slew them hundreds of years ago." The actress playing Erika Benteen, Susan Gibney, also plays Dr. Leah Brahms in TNG's "Booby Trap" and "Galaxy's Child." Is Red Squad anything like Nova Squadron from TNG's "The First Duty"? Why is Earth's power grid centralized? I'll have a more thorough analysis of this episode in the next entry. "We have a war on our hands" is a good bit of foreshadowing for the show. It is becoming clear that DS9 is moving inexorably in that direction, even for people who don't really know.